Text SUNSET to 95577 for more info or click here for full details! 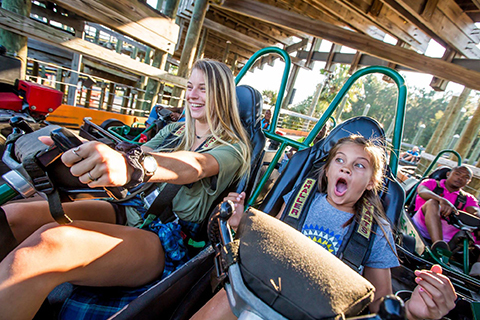 Enjoy the fastest fun around on The Track’s Wild Woody – a go-cart track that rides like a roller coaster! The Track offers fun, excitement and entertainment for everyone in the family with miniature golf, bumber boat rides, kiddie rides and more. Enjoy one free rechargeable Track Card with 14 free points per unit, per paid night stay, with reservations made in advance. Reservation required. Noncumulative and nontransferable. Unused admissions expire daily. Your mini mates will explore the Gulf waters dress like pirates, get their face painted, and learn some pirate lingo. 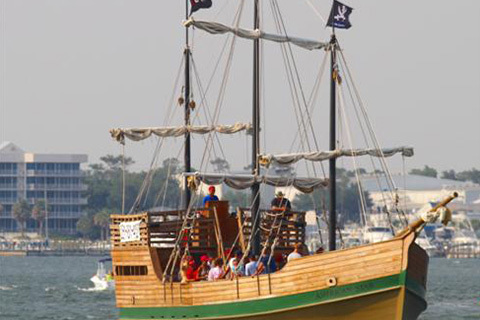 Once on board, the young pirates will defend the ship in a gun battle, sing along with the pirate crew, hear true stories of pirate attacks in the legendary Pirates Cove, and hunt for the Captain’s lost treasure chest! A family oriented fishing trip aboard a 60’ party boat with an air conditioned cabin that goes approximately 15-20 miles offshore for bottom fishing. 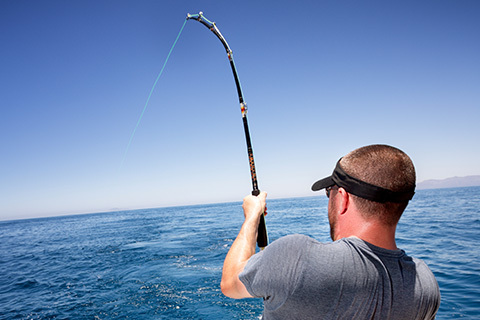 Everything you need for fishing, such as rod, reel, bait, tackle and fishing license is included. Snapper, Trigger, and Red Ruby are typical catches. Waterville USA is a 20 acre water and amusement park. 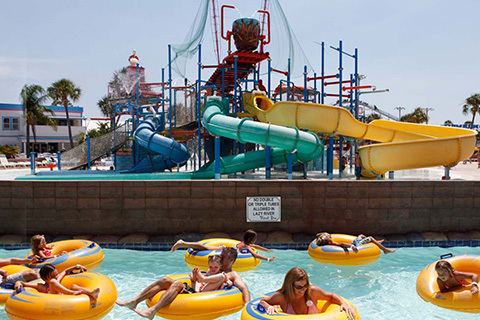 The water park includes a wave pool with three foot waves, two water slides and a lazy river for floating. The amusement side of the park includes go karts, miniature golf, laser tag, children’s rides, the Cannonball Run wooden roller coaster, and 10,000 sq. ft. of carnival type games. This dolphin and nature cruise combines all the features of the dolphin cruise with extra floating time through the hidden creeks of the back bays. The first hour is spent locating and observing the local dolphin pod, and the second hour is spent far up in the swamps observing osprey, herons, bald eagles, and red-tailed hawks. 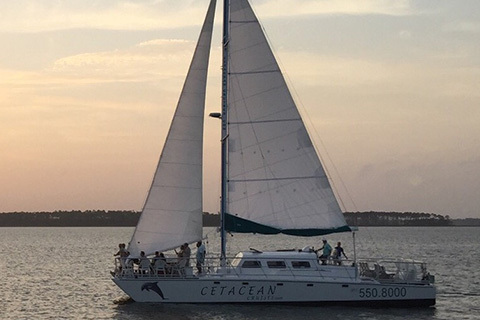 Come enjoy a sail at sunset aboard the Cetacean, a 52-foot Hawaiian catamaran that provides stability for a smooth ride! 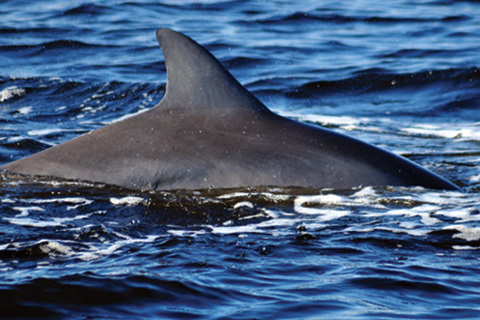 With the wind in our sails, the Cetacean skims along the waters of Orange Beach, Alabama and Perdido Key providing you with a close up and personal view of coastal wildlife and marine life! Enjoy one free adult admission for the 2 hour sunset sail cruise per unit, per paid night stay, with reservations made in advance. Reservation required. Noncumulative and nontransferable. Unused admissions expire daily. Soldier’s Creek is a Par 72 course set through rolling hills, lakes and nature trails offering great playability for all skill levels. 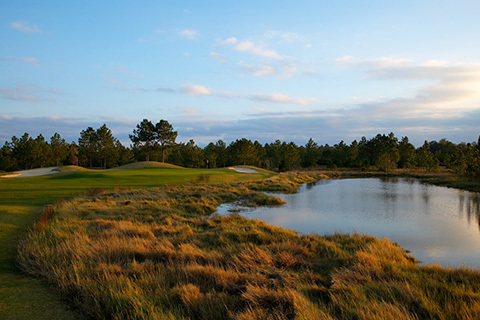 The course features wide player-friendly fairways and water comes into play on only two holes. 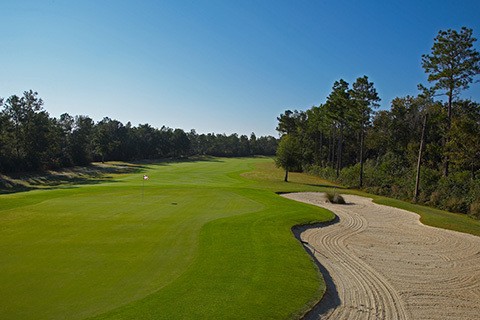 Glen Lakes Golf Club offers two distinct courses to choose from: “The Vista Dunes,” a Devlin-Von Hagge layout with an 18-hole, par 72 course; or “The Lakes,” a par 35, resort-style 9-hole course with water on six of nine holes, which you may play twice.